Tour begins Friday, May 24th. Please select a date on or after May 24th. First you'll depart from our convenient Pigeon Forge, TN, location. Your tour begins when your Certified Interpretive Guide brings charming Gatlinburg’s story to life. You’ll take in the sights of the shops and attractions from your seat in a custom-built, open-air Pink® Jeep® Wrangler. With your hands on your camera and your guide’s hands on the steering wheel, you’ll head toward a road where tour busses can’t go. The heavily forested Roaring Fork Motor Nature Trail is a single lane road. The open-air Jeep beneath the canopy of trees fills your senses. The climb rewards you with viewpoints from high above. Along the way you’ll learn of the hardwood forest in the Smoky Mountains. A narrow, paved path through chestnut oak, white oak, magnolia, maple and tulip trees take you to the pinnacle, where stops at overlooks give you striking views. From here, you’ll begin your descent. Historic structures dot the road’s edges. This was the American Frontier in the 1830s and 1840s. Log cabins and mills remain and your Pink guide will tell you their stories. The sound of a stream catches your attention. As your Jeep descends the winding road, the stream builds. Soon, cliff-hugging waterfalls and rolling Waters become unspoiled stops for remarkable photo opportunities. From Roaring Fork, it’s one last pass through Gatlinburg on way to a thrilling off-roading ride through a trail on private land. 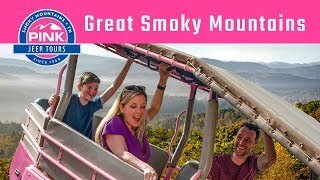 Your professional Pink Jeep guide has been expertly trained to give you an experience unlike any other in the Great Smoky Mountains—an adventure that you will share with loved ones.